Looks great Mike! Sorry if you have already mentioned it but what do you use for staining the wood? It looks very nice. I�m using a two-step process. First I stain the wood with a light yellow-brown furniture stain. I use it a lot when I do unweathered interior wood such as my machine shop on page 30 of this thread. Then I use a Hunterline brown stain. I usually stain weathered wood a gray but I thought a coal trestle would have a different look. I�ll probably go over it with Bragdon powders before I�m done. Thanks Mike! Always interesting to know other methods. I'm taking a rest from working on the coal trestle proper while laying the approach track to the trestle. I also added a new, all-purpose track next to my car shop for in-place repairs, dropping off supplies, and perhaps car painting. Here's a view of the engine house(left) and car shop showing the new turnout and shop track. A little closer view of the facilities; I've started adding piles of supplies etc. 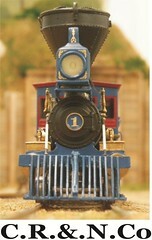 typically seen around railroad shops. I'll probably run trains over the new track for a while before ballasting. Mike, that is looking so sharp!!! Thank you for following along and for the kind words. Mike, the area looks good. it's starting to look like work happens there. Nice looking scene on the layout, Mike. A lot of hours in making the buildings and trackwork but it sure is worth the effort. You shops scene is REALLY coming together nicely! Yer doin' good! Wow, that is some car shop. Looks good Mike.. What is the overall layout size? While researching today on some older threads, please excuse me for not posting much lately, as I had forgotten you were in the process of building this wonderful layout. You are progressing with a nice build on the trestle. I like your work and attention to detail. And I must remember to stop by occasionally for lessons in modeling to prototype, such as you do. It is very rewarding to set back and gaze at what you accomplish. I do that myself when building something, and make changes here and there. Excellent carshop and surrounding structures.